Co-washing – have you heard of this trend before? If you wondering what it is, let us tell you that co-washing is simply short for conditioner washing. Yes, that’s right, washing your hair with a conditioner. It is a popular trend among women with curly and thick hair so that their hair can gain from the moisture derived from the conditioner. Nowadays, more and more women are transitioning to using a cleansing conditioner to wash their scalp and hair since they find it to be better than washing the hair with a shampoo. If you are willing to give it a shot, here are the things you need to know about co-washing. Co-washing is a part of the no-poo method where women skip the use of shampoo due to the presence of sulfates in it. The sulfates in the shampoo are surfactants that cause the shampoo to lather up. They strip the hair of vital moisture and leave it dry and frizzy. This is especially hard on women with curly hair since dryness causes more frizz and leaves their hair unmanageable. So instead of using a shampoo to wash the hair, a conditioner is used. The conditioner does not have any sulfates and hence it does not dry up the hair. In fact, what it does is that it adds more moisture to the hair, making it more manageable. While women with curly and frizzy hair have been doing this for a while now, it is slowly becoming a mainstream trend. Instead of using a shampoo, you would need to use a conditioner to wash your scalp and hair. If you are not too comfortable with the idea of only using the conditioner or are worried that it would leave your hair limp, then replace one of the days of shampooing with the co-washing method. This will help you see the benefit of co-washing in between two shampoos. To wash, simply take a dime sized amount of conditioner and smooth it onto wet scalp and hair as you would with the shampoo. It will not lather, of course. But you can feel the conditioner spreading onto your scalp and hair. Leave it on for about a minute and rinse well. As with the case of shampoo, you need not repeat this process and can stop at one application. However, make sure to rinse well in order to prevent build-up of the conditioner in the scalp and the hair. What kind of conditioners should I use for co-washing? Use conditioners that are free from silicones in case you are going to try co-washing. This is because silicones form a coating around the hair and are difficult to rinse off. Since your usage of shampoo is reduced, it is difficult for you to get rid of that buildup. Of late, many brands have introduced “clarifying” conditioners targeting the women who are into co-washing. You can try the L’Oreal Ever Creme Cleansing conditioner or the Ouidad Co-wash Low-foam cleansing conditioner or WEN Cucumber Aloe cleansing conditioner, all of which are popular among women who practice co-washing. Conditioners do not contain sulfates that strip the hair of moisture. This keeps your hair soft and scalp irritation free. 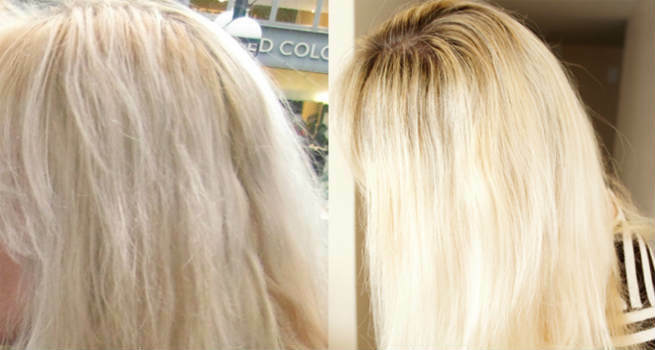 Your hair color is retained for longer when you wash with a conditioner. Co-washing ensures that your scalp and hair do not become dry and frizzy. 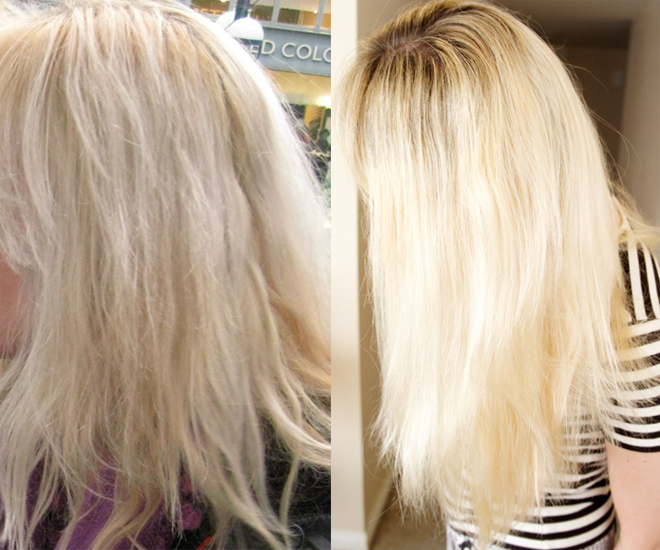 You can see the difference in the hair texture in the image below, taken before and after adopting co-washing. Now that we have told you all that you need to know about co-washing, we come to the question of whether it is for you to try. 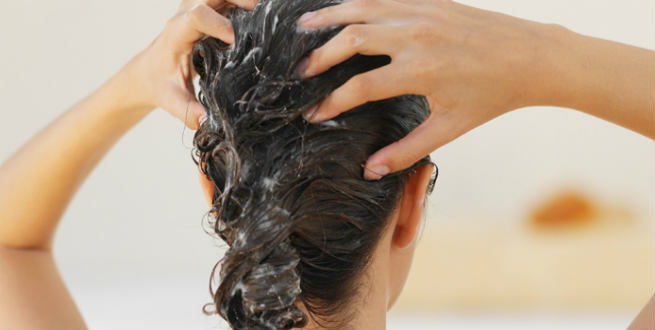 If you have dry and frizzy hair, then co-washing will certainly help make your mane more manageable. However, if your hair is oily, then it is best to stay away from this regimen since the conditioner can make your hair limp and more oily. For women with normal hair, you can skip the shampoo once a week and replace it with co-washing and slowly phase out the usage of shampoo according to how your hair behaves. But remember to use a mild and sulfate free shampoo once a while to clean the scalp and prevent any buildup.